Starting over Some suggestions for reigniting the drawing spark if you've left it for a while. This Course is now full. Please contact me to go on a waiting list. The Course Fee does not include accommodation or full board. There is an additional cost for this which varies depending on the room type. (£390 for 5 nights full board for single or twin ensuite to £320 for 5 nights full board single or twin with shared facilities (a limited number of twin rooms are available for people sharing at a reduced cost subject to availability). "I feel confident I can improve my drawing the tools and techniques I've learnt"
When we’ve had a break from drawing for whatever reason it can be hard to start again. There may be a fear that we’ve forgotten everything we’ve learned; it might seem too complicated to get our drawing materials out and they seem unfamiliar. It’s almost as if we’ve forgotten what we do with them! How can we move out of the drawing desert and get back into it? Draw on other artists. Look at books, visit a gallery – online if you can’t visit in person. Allow yourself to be inspired – notice what grabs your attention – the subject? Colour? Feed your senses. Pick up a pencil and allow yourself to play with it. Don’t set out to do something ‘big’ – that can seem too daunting. 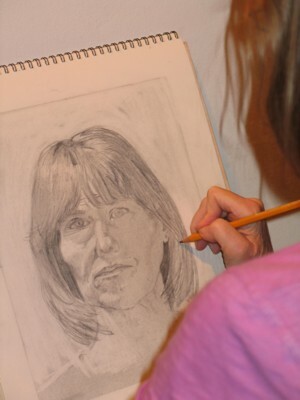 You need to tune into your drawing muscles – reminding yourself how to look and exercise that hand/eye co-ordination. Perhaps visit an art store and walk the aisles and see what grabs your attention. Treat yourself to something – it could just be a single pencil or a new sketchbook! Perhaps experiment with an unfamiliar medium. When we try something new we have no expectations, which can take the pressure of if we haven’t drawn for a while. Remember, the skill of drawing is like riding a bike. You never lose it. You might wobble a bit coming back to it but if you keep going, you’ll quickly hone those skills once more. We can always start again - and again and again!